Spanning 5 long days and 3 conference halls the size of jumbo jet hangars, the Game Developers Conference is an astounding display of the industry's current girth. If you have a particular interest - say, "Facial Rigging" or "Sweater Animating" - this is the one place you will not only find others like you, but relevant classes, lectures and possibly a luncheon or two. How perfect, I thought, when I booked my flight. I'd had a curious, if somewhat unexplainable fascination with hands in first-person shooters ever since I was assigned a countdown list for an old job in 2008. Someone at GDC - a developer, a publisher, a guest speaker - was going to justify my niche interest. I could feel it. Outside the hall that hosted the "Designing Games for the 43-Year-Old Woman" seminar and stunk of stale bagels, I encountered my first subject: a PR guy who I knew was repping a number of first-person shooters. "We love hands," said the gel-haired man who had already booted his Outlook Inbox. "So you coming to this party tonight? I hear they're serving fried macaroni and cheese!" I don't think he was giving my question the attention it clearly deserved. Fortunately, the conference had just begun and there were plenty of other people left to validate my opinion. "Hahahahaha," belched an inebriated developer two nights later. "Wait, you're serious?" Was it so strange for a reporter to ask about the significance of well-made hands at a conference with sessions titled "Gamification 201 - 60 Tactics in 60 Minutes" and "Saying "Goodbye" to Shadow Acne"? As I boarded my plane back to New York City, I realized "yes." 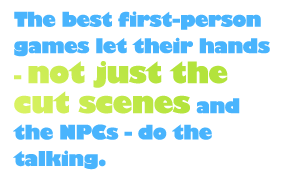 Yes, it was weird to ask everyone in this industry about hands in first-person shooters. But it shouldn't have been. Spoken about like D-list co-stars, hands play a variety of A-list roles that affect the gameplay, graphics, and mood in the US' most popular genre; the fact that most everyone I speak with seems flippant about them might explain why, for the most part, they look and feel, pardon the pun, slapped together. The problem with hands in most first-person shooters is that they have three jobs and they rarely do any of them well.